And in 1977, no one questioned it. However, the legal question remains, was Han Solo legally justified in killing Greedo (Provided the Empire’s Doctrine of Fear had similar Common Law traditions)? The 1997 re-release of Star Wars has Greedo firing his blaster before Han. Moreover, Greedo wildly misses in extremely close quarters, if not point blank range. This made Greedo not just a horrible shot, but an extremely bad bounty hunter. 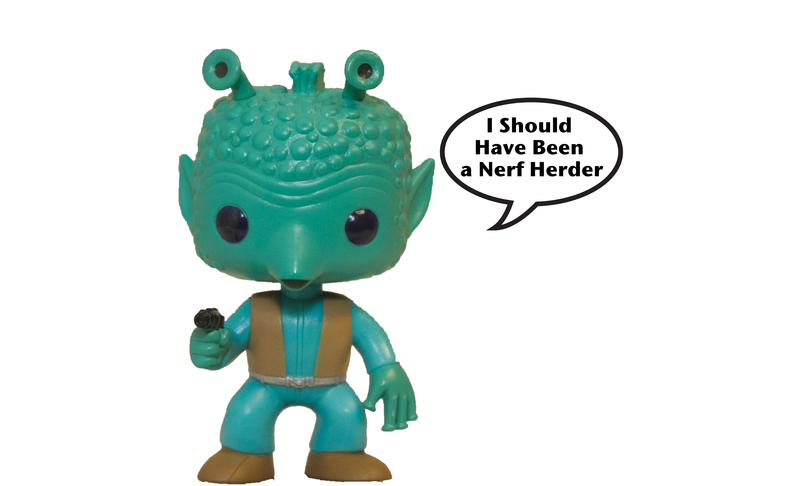 Greedo should have been a Nerf Herder. [A] Common Law – Deadly force is only justified in self-protection if the defendant reasonably believes that its use is necessary to prevent imminent and unlawful use of deadly force by the aggressor. Deadly force may not be used to combat an imminent deadly assault if a non-deadly response will apparently suffice. 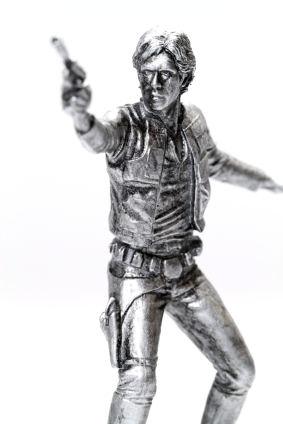 The issue under common law is whether Han reasonably believed that deadly force was necessary to prevent imminent and unlawful use of deadly force by the Greedo. The next issue is whether Han was required to “retreat” from Greedo. [A] Common Law – If a person can safely retreat and, therefore, avoid killing the aggressor, deadly force is unnecessary. Nonetheless, jurisdictions are sharply split on the issue of retreat. A slim majority of jurisdictions permit a non-aggressor to use deadly force to repel an unlawful deadly attack, even if he is aware of a place to which he can retreat in complete safety. Many jurisdictions, however, provide that a non-aggressor who is threatened by deadly force must retreat rather than use deadly force, if he is aware that he can do so in complete safety. A universally recognized exception to the rule of retreat is that a non-aggressor need not ordinarily retreat if he is attacked in his own dwelling place or within its curtilage [the immediately surrounding land associated with the dwelling], even though he could do so in complete safety. 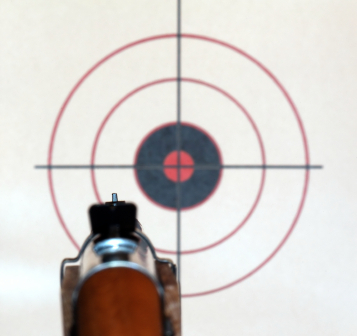 [B] Model Penal Code – One may not use deadly force against an aggressor if he knows that he can avoid doing so with complete safety by retreating. Retreat is not generally required in one’s home or place of work. However, retreat from the home or office is required: (1) if the defendant was the initial aggressor, and wishes to regain his right of self-protection; or (2) even if he was not the aggressor, if he is attacked by a co-worker in their place of work. However, the Code does not require retreat by a non-aggressor in the home, even if the assailant is a co-dweller. The privilege of self-defense is based on reasonable appearances, rather than on objective reality. Thus, a person is justified in using force to protect himself if he subjectively believes that such force is necessary to repel an imminent unlawful attack, even if appearances prove to be false. 4. Any prior experiences which could provide a reasonable basis for the belief that the use of deadly force was necessary under the circumstances. While Han was justified in shooting first, a better question is why did Malcolm Reynolds shoot the Alliance pilot who was surrendering in Serenity? I only ever saw the original, so I never understood the argument about who shot first. Also, given that it was a fairly lawless place, did Solo really need a legal argument? More important, could Obi-Wan be sued for grievous bodily harm (or is it ‘arm’)? It seems to me he used unnecessary force causing grave bodily harm when he could have used the Force to restrain/control the thug threatening the whiner. As for Mal shooting the pilot . . . Whedon is under the impression the only way to show intent and make audiences ‘believe’ stuff is to unnecessarily kill people. It’s not a legal issue; it’s a lack of imagination on the part of the writer. That said, they were really not set up to take prisoners. I suppose they could have strapped the pilot on Serenity for their run past the Reavers. Doing so while he was still alive would be cruel and unusual punishment (but justified in my book – he did bomb innocent civilians) so shooting him was a piece of mercy.